Combine water and farro in a pot. Bring to a boil, reduce to a simmer, and cover with a liquid. Let cook for 25-30 minutes until farro is tender, adding ¼ cup more water if needed to soften grain. Remove from heat and stir. While farro cooks, head olive oil over medium-low heat in a skillet. Add minced garlic and cook for 1 minute. Stir in tomatoes and balsamic vinegar. Cook tomatoes until warm and soft, 4-5 minutes. Press tomatoes with the back of a wooden spoon until the tomato burst. Add herbs and cook for another 2 minutes. Once tomatoes are bursted and farro is done, add farro to the skillet with the tomatoes and cook until farro absorbs some of the tomato juice. Divide into two bowls, sprinkle with goat cheese, and serve. There are different types of farro: pearled, semi-pearled, and whole. While I prefer the whole (all nutrients are still intact), pearled farro makes for a quick meal. 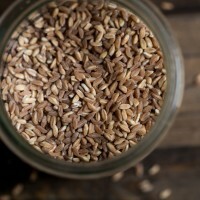 If wanting to use semi-pearled or whole farro, increase the cooking time and add more water as needed.